The Semi Electric Camry is OK, if not exciting. Things have changed rather a lot since the first hybrid landed here. The Prius is still seen world-wide as “a hybrid” and if you want to be green, and “seen to be green” then it is a Prius you buy. Of course there are so many semi-electric options now. Honda, Nissan and Lexus have hybrids but now the Germans have gotten in on the act. Sadly Holden’s costly version, the Volt, languishes unloved and unsold because Australians will not pay $65k for a small car. Whether a ranger extender or not, it is simply too expensive. Nissan’s leaf and Mitsubishi’s EV’s have been even slower sellers. We are not yet ready to completely abandon fossil fuelled transport. The exterior is a bit slab -sided. It’s a great shame we are not doing the review for the 2015 model. It is stunning. As for this one, I don’t actually dislike it, but doesn’t inspire me to break into choruses from the Sound of Music. Importantly, it is the “not offensive” design that is what has made Toyota so big. They go for mass market appeal being careful not to polarise anyone along the way. 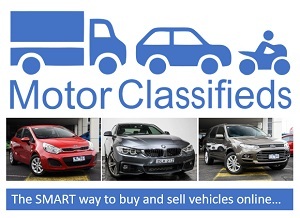 That safe attitude sells lots of cars but they will be bought for practical reasons, not because of desire. It’s a shame because they are so well and along with cockroaches, will be the only things left standing after the nuclear Armageddon. The head and tail lights are not particularly attractive and have been upgrade for next year so I’ll leave my dislike of them pass this time. There is a touch of the wedge going on so I can’t understand why the designers didn’t inject a bit more je ne sais quoi. I sat in the new Camry for the first time, and liked the huge improvement in the cabin design. The previous model looked a bit wrong. Here, the switch gear is all in the right spot and is very easy to use. I particularly loved the JBL sound system which had the high-end sensation you expect from a premium German brand. The interface feels slightly awkward in places but is saved by physical buttons on either side of the screen. The touch-screen Satnav is easy to programme and Bluetooth easy to pair. The one thing I can’t tolerate is slow reacting systems that are impossible to navigate. I’m thinking of Volvo’s system which needs input from a dial like a 70 telecom phone. It’s positively 20th century and takes what feels like hours to respond to inputs. I’ve mentioned the seating but it would be churlish of me not to mention how comfy they are. The poor passenger has to make do with few electric adjustments than the driver which is silly given that full adjustments are available. After all the Camry sells in left and right hand drive. Cheeky Toyota has cut a few costs unnecessarily but since they aren’t daily controls it doesn’t matter much. The glossy brochure describes the leather as “accents”. Does that mean there is also “pleather” sneaking in surreptitiously? Certainly the dash board reveals a man-made origin upon closer inspection. In order to test properly, the extra beefy lads were unavailable so I roped in my “honorary gay” friends and did a school run. 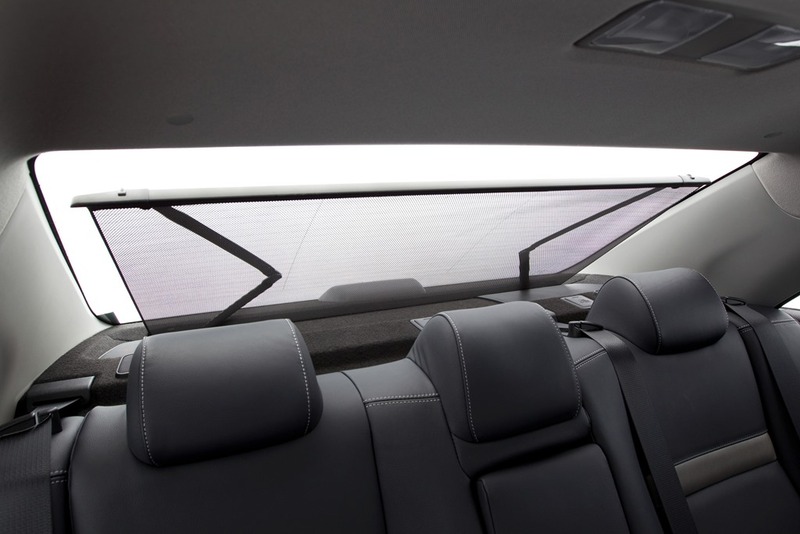 Remarks were made on the spaciousness of the cabin and the “sunroofness” of the sunroof. I’m pleased to see the plastics looking less poverty and more premium. That’s a bit mean because most car makers have improved their materials, so snaps to Toyota for taking full advantage. However the interior does not match the high quality feel of Holden’s VF Commodores. We had the top model “L” for-luxury-model at $45.878. The pov model is $39, 607 so what goodies do you get for your 16 grand extra? 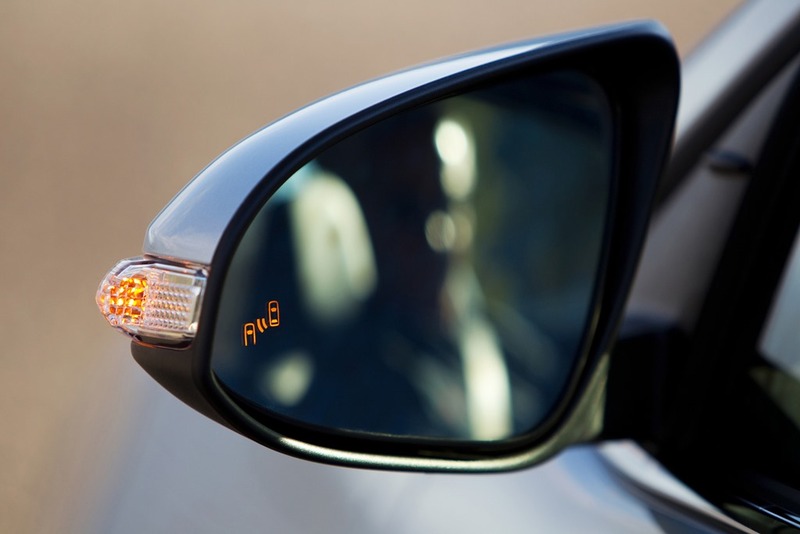 Auto lights and wipers with keyless start and entry are standard. You not only have electric leather seats and climate control, but you also get driver aids like a rear camera and blind spot warning. One thing worth mentioning is at this price the L model competes with Holden’s Calais ($44,670). Calais is one of my favourite sedans under 100k. It feels premium from end to end, and it parks itself. 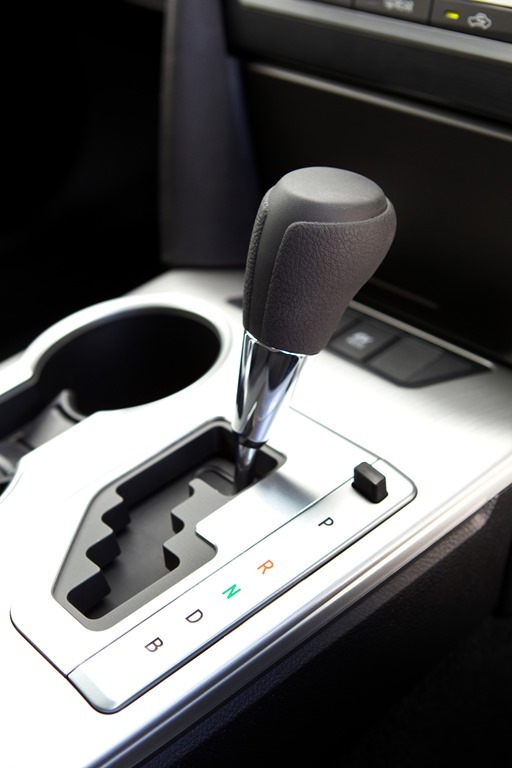 Like most hybrids, fuel consumption is only part of the reason. Most of the reason lies in the fact that some people want to be seen to be green whether or not they actually are. The real-life fuel consumption figures differ wildly from those claimed by the manufacturer. People get terribly bent out of shape about it, but unless the test conditions are the same from model to model there is no other way to truly compare apples and apples. 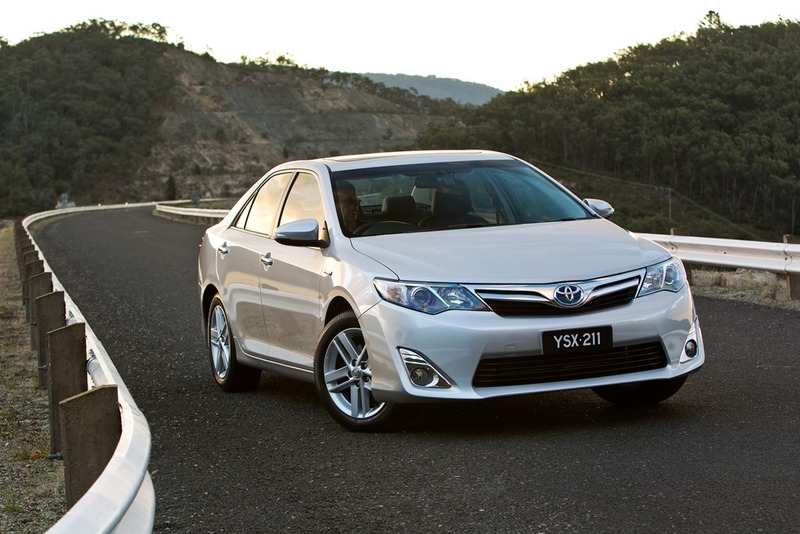 The Calais uses 9.0L/100k compared to Camry’s 5.2. 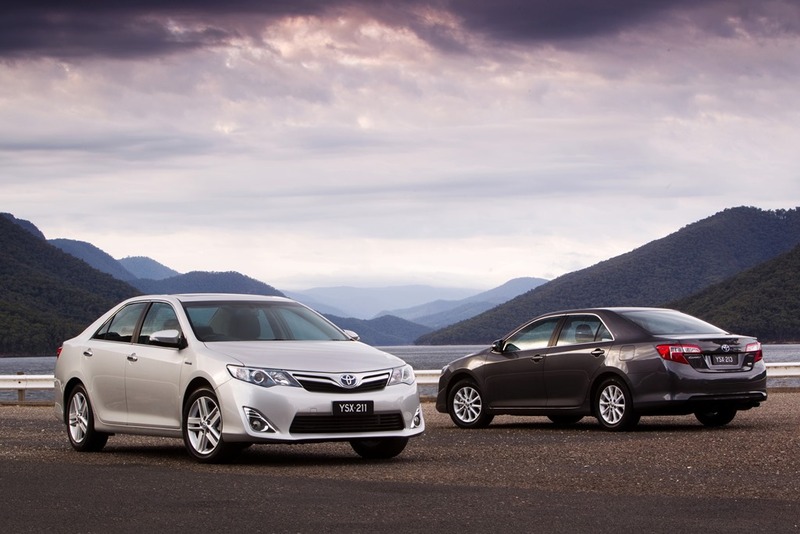 This means the Toyota uses 45% less fuel for a car similar in size to the Holden. More fuel means more CO2, more cost, more tax, and considerably more power. The Camry drives reasonably well without being overly exciting. It has plenty of room and will easily do a long trip. 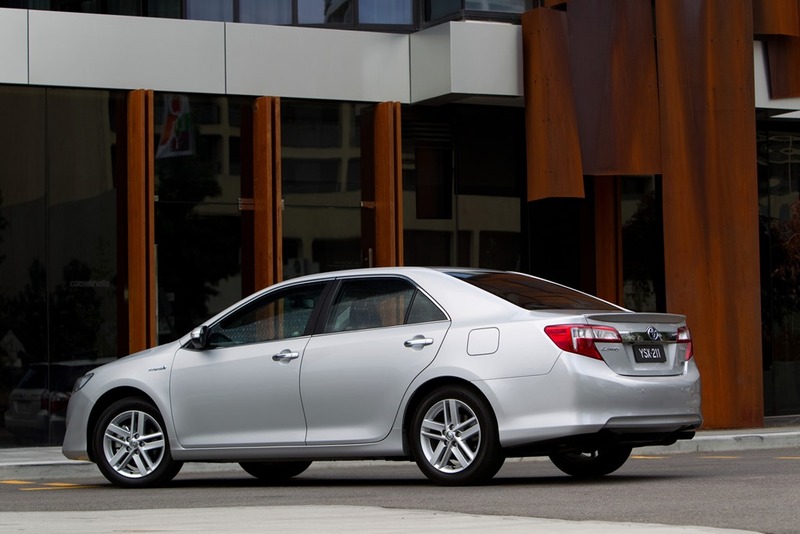 You have to get used to the slightly floaty steering but Camry does go where you point it. The ride can be harsh at times. It tends to bump nastily on corners if you hit ruts on the way through. It’s not unpleasant as such, but it could be better. It’s the handling in hybrids that always makes me feel a little uneasy. 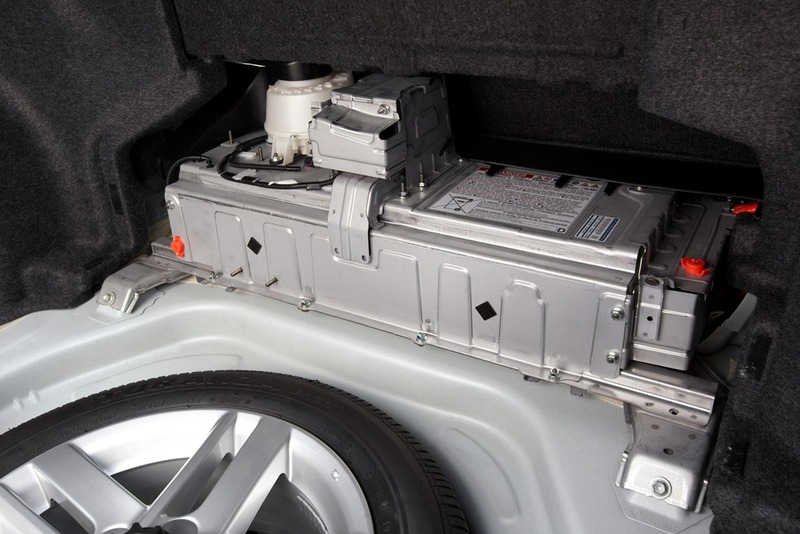 You certainly notice the extra poke from the electric motor but you also notice the weight of the batteries. As you corner you feel like the back of the car is going to swing out rather awkwardly. It’s an uncomfortable feeling. I was never quite sure if the sensation was just in my mind, but it was a feeling I couldn’t shake. I got used to it, but I never accepted it. I’m a hybrid convert because where once I questioned battery life, I now admire the fact that decade-old batteries r still going strong. More importantly, I “get them” now. They are cars built for how we actually use cars, not for how we want to use cars. In other words we drive in cities, in traffic and are far more likely to fly any distances longer than a few hundred kilometres. Moreover, most of us don’t often make many journeys of that distance, so the hybrid is a product of its time. If you live in the country your needs will be different and a diesel or turbo petrol is going to be more up your ally. There are lots of inclusions in this top model. The blind spot alert is a favourite, now I’m used to it. I could live with the Camry hybrid but it would only ever feel like transport. I pondered for the longest time whether or not I’d buy one, and the answer is no, but I could live with it if it came with the job.